There is an old illustration that was developed by Dawson Trotman, the founder of the Navigators. 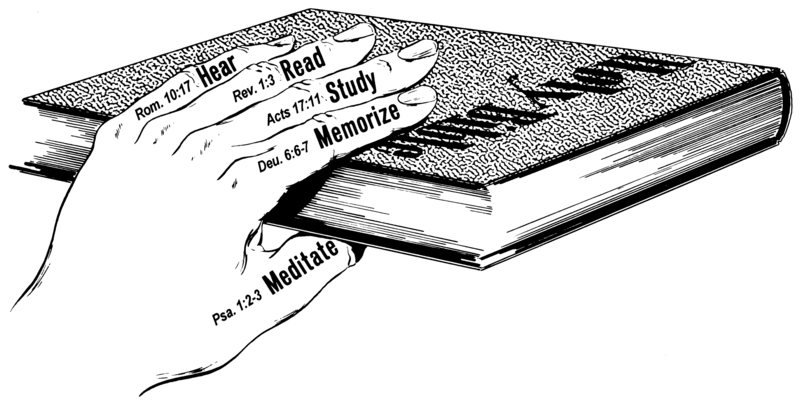 It uses a hand, with the fingers and thumb representing five activities that enable us to get a grip on the Bible. The little finger represents hearing the Bible. The little finger is, of course, the weakest. Hearing the Bible read in church or read by an app on our phones, is of value but only of very limited value. We need to add other practices. The ring finger represents reading the Bible. The middle finger represents studying the Bible. Looking at more than one passage. What do other passages say about this same topic? What light is shone by other passages? Using other tools such as a concordance, or a commentary, or a Bible dictionary. One simple method is to make marks on your Bible. People underline verses that seem particularly powerful. The so-called Swedish Method involves putting a question mark next to things you don’t understand, an exclamation mark next to something that strikes you as important or challenging and an asterisk next to any verse that hurts and you need to do something about. The index finger represents memorising the Bible. The index finger is the strongest finger of all. We might forget most of what we hear or read but we retain 100% of what we memorise. Ps 119:11 I have hidden your word in my heart that I might not sin against you. When we memorise scripture, we can use it any time we need it – to resist temptation (like Jesus did) or to worship God or to encourage or guide someone else. Our grip on the Bible is much stronger when we listen, read, study and memorise the scriptures. The thumb represents meditating on the Bible. Think how limited your hand would be without the thumb. The thumb can be used in conjunction with each of the other fingers. We can listen and meditate, read and meditate, study and meditate. And, if we have memorised scriptures, we can meditate on them at any time. If we want a good grip on the Bible, we need to soak ourselves in it – hearing it, reading it, studying it, memorising it and meditating on it. Joshua 1:7-8 Be strong and very courageous. Be careful to obey all the law my servant Moses gave you; do not turn from it to the right or the left, that you may be successful wherever you go. Keep this book of the Law always on your lips; meditate on it day and night, so that you may be careful to do everything written in it. Then you will be prosperous and successful. God promised Joshua success that success depended on what he did with the scriptures – the law he had received from Moses. Joshua had been Moses apprentice as he was trained to take over. He had heard the teaching from Moses’ lips. Tradition says that Moses wrote the first five books of the Old Testament, and that is borne out by this passage. Joshua had a written copy. So, he had heard and was able to read the scriptures. He was also told to keep it on his lips. That suggests he was to speak it out as he gave instruction to the people, as he settled disputes, as he taught. Speak scripture. Keep it on your lips. But that also implies that he had memorised it. What Moses had spoken to him, he had memorised and, having memorised it, he was able to speak it. But then God said that he was to meditate on it. Meditating simply means to ponder it; think about it; turn it over in your mind. Joshua was to mediate on it day and night. He was to be constantly be thinking about God’s word so as to hear God speak and gain understanding. But ultimately, he was to put it into practice. Twice God said that Joshua’s success depended on obeying all of it (v.7) and being careful to do everything written in it (v.8). The point of all Bible listening and reading and study and memorising and meditation is application – putting it into practice. Success does not depend on reading or studying but on doing. I talked two weeks ago about where someone new to the Bible might start but what about the long-time reader? As these people have indicated, it is easy to just read the bits we like and to avoid the bits that are more difficult or more challenging. That is a temptation we should avoid because, to quote 2 Timothy 3:16, all scripture is inspired and is useful for teaching, rebuking, correcting and training in righteousness. Some parts are easier to understand and seem more applicable but all scripture is inspired and all scripture is useful. If we don’t read it all we are missing out on some of its usefulness. In his farewell address to the Ephesians elders (Acts 20:27) Paul said that he had not shrunk from declaring to them the whole counsel of God. There are aspects of biblical teaching that we would rather avoid. It would be nice, wouldn’t it, to talk about the love of God but never about the wrath of God? But Paul didn’t dodge the less palatable aspects. He taught the whole truth and we need to read the whole Bible to have that full understanding of the things of God. Reading the whole Bible is pretty daunting. I don’t mean in one sitting! There are ways to make that easier. There are Bible plans and devotional books that will lead you through the whole Bible. If you want help finding a reading plan, let me know. I have lots. Some will suggest a mix of Old Testament, New Testament and a psalm each day. Perhaps the simplest method is simply to have a table with a space for each chapter so that you can tick it when you have read it and make sure that you have covered the whole Bible. We shouldn’t underestimate the value of being led by God. Pray and try to hear the voice of the Spirit. We might not be very good at hearing what God is saying but, even if we don’t always get it right, on other occasions God will lead us to the passages that He knows are what we need to read. God can speak through random verses but we need to progress beyond just tiny sound-bites of scripture. We need to know how to read whole letters as they were intended to be read and whole books as they were intended to be read. When Paul wrote letter to a church, he presumably never imagined that they might read one sentence from the middle of it and then put it down again. The whole letter was a unit. Paul’s thinking was developed over the course of that letter. We do not understand the message of the letter by picking out a few verses. The gospel writers told a story with a beginning, a middle and an end. We need to hear that story, not just a few selected verses. Why did the author write this letter? What was his main concern and how did he make his point? Are there words or phrases that are repeated often and that give a clue to its emphasis? What was the context in which it was written and the issues being addressed? Our Bible study shouldn’t be random. Imagine if children went to school and the teacher picked a book at random and picked a page at random and that became the lesson for the day. Such a disjointed approach would not achieve much. Teachers assess where the class is at and what is relevant. Rather than reading random things, where are we up to in our growth? What is God highlighting as an area of emphasis at the moment? What topics are pertinent and needed? For example, maybe God is saying that you need to be careful about the way you use your tongue. So, hunt out what the Bible says about the use of the tongue. It has a lot to say about that. Or maybe you realise you don’t know enough about discipleship. So, study Matthew. Maybe you are suffering or you want to help someone else who is suffering. The Psalms or Job or 1 Peter might be a treasure trove of relevant material. In other words, your Bible reading and your life should be connected. I love it when I see people who want to get a better grip on their Bibles because, just as it was the crucial factor in Joshua’s leadership, there is nothing more crucial in our lives as Christians. We need to know what God says and to align our lives with what God says. So often, in the scriptures, success is linked to knowing and doing the word of God. To get a strong grip, we need to listen to the word, read the word, study the word, memorise the word, meditate on the word and, most importantly of all, obey the word.